I am writing to ask for your kind help to save my friend's son. I am Yogesh Rajwade. 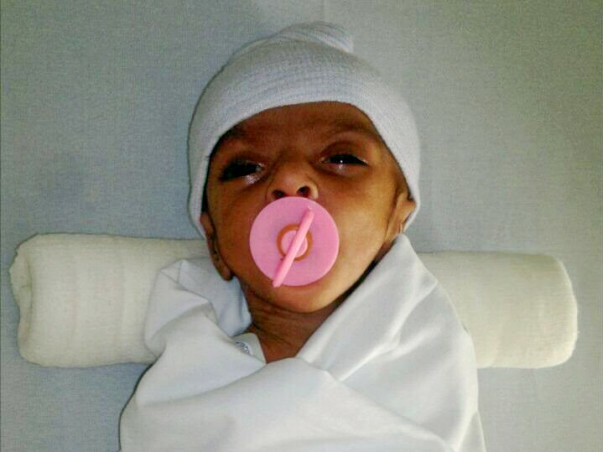 My friend Rahul Surve's son, who is 8 months old was diagnosed as having serious congenital heart diseases. 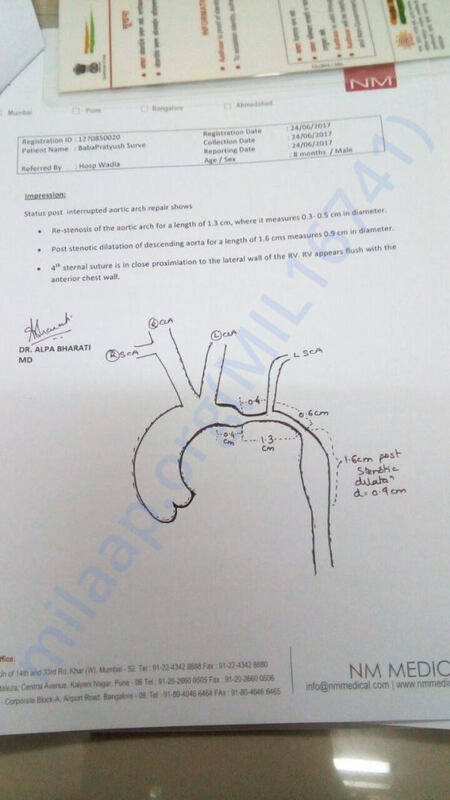 He has undergone three heart procedures elsewhere in last six months but still he is facing breathing and blood circulation problem because veins are again and again getting narrow and blocked. 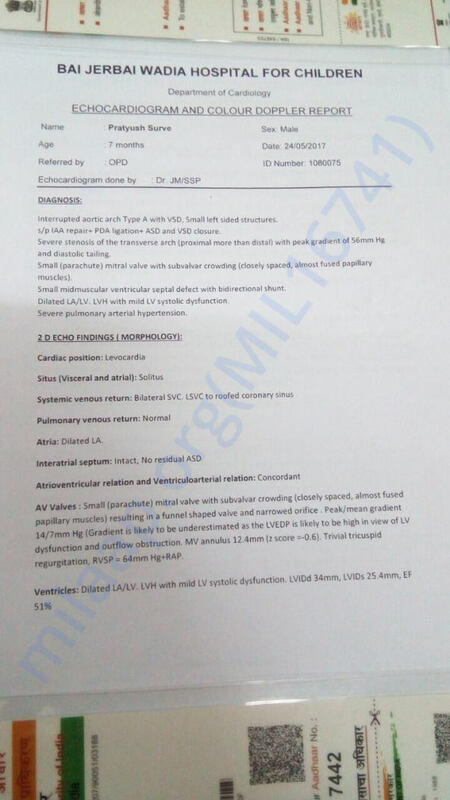 As per doctors opinions again need to do second open heart surgery and mitral valve repair or replacement so my friends 8 months old can be survive like normal child life. His son is presently under care for his heart aliment at ''BAI JERIBAI WADIA HOSPITAL FOR CHILDREN" in Parel, Mumbai. Dr. Biswa Panda and his Team will do surgery in July 1st week. The operation cost in package will be around 5 lakh including medicines, injections and per day NICU hospital charges. He can't afford that much amount and he is looking for kind support from you all to contribute amount for his son's treatment. !! Many Thanks !! 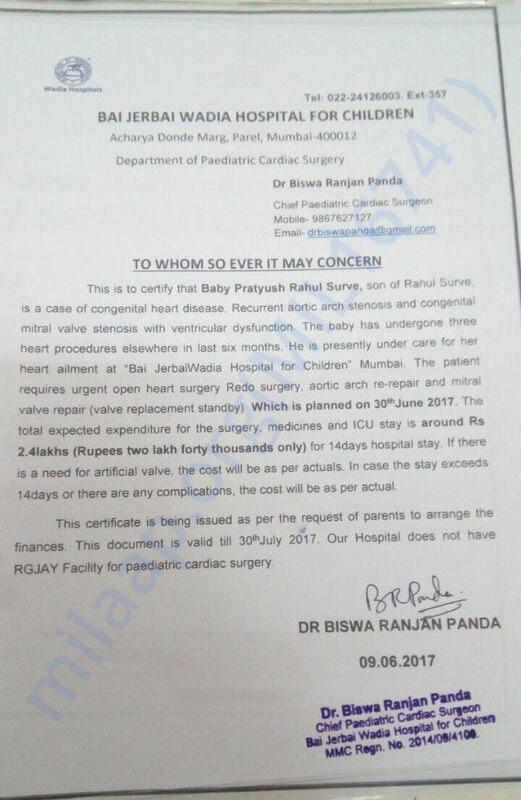 for supporting me to cover amount for my Son Master Pratyush Surve his Second open heart Surgery. I would like to inform you that my kid had went through the heart surgery and it went well. He is currently under observation for at least 9 months and so far he is responding well to the treatment. I am deeply grateful for the support I received from my fellow colleagues during time of crisis. The response from everybody was overwhelming and I appreciate it from bottom of my heart. I would like to specially thank to Mr. Yogesh Rajwade for their continuous and timely support. Again Pratyush's surgery is postponed because his heart pumping ratio is low. 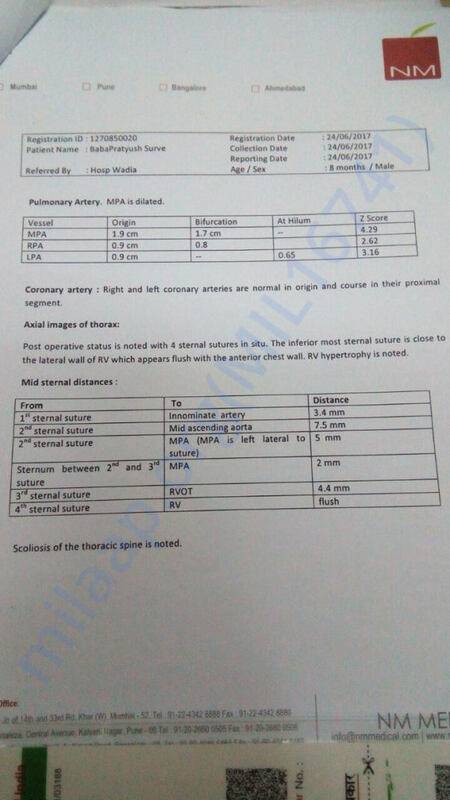 It has been scheduled on 16th August now which has been suggested by the doctor. The heart pumping ratio has to be at least 47% before he can be operated. The doctors suggest that the costs are going to increase as the baby will take at least 30-45 days to recover as he is very week. Thank you for all the support. Pratyush is undergoing with few tests which are necessary for admission. We are still short of funds. Keep spreading the word. Thank you all for your contribution.